I just learned that Robert - Rob - Holdstock, a good man and a superior author, has died in intensive care after being laid low by an E Coli infection. He was 61. I first corresponded with Rob when he and Chris Morgan were co-editing Focus, a magazine on writing for writers and would-be writers, for the BSFA. We met at the next Eastercon, I believe it was. Strongly-built and bearded, back then he seemed indestructible. Despite health issues in recent years, he remained a presence who could light up any company by being a part of it. I remember him telling that one of his reasons for giving up zoology for writing was that he hadn't anticipated having to deal with the animal suffering that was involved in the science. His novel Mythago Wood made huge and lasting impression on me. A beautiful and sure-footed conflation of English myth and grounded wonder. Despite this world-class talent, he was without artistic airs and graces; he saw himself as a working pro. But he was the kind of working pro we should all aspire to be; ready to share, ready to teach, and incapable of giving less than his best. When he conceived and sold the Night Hunter series, which he wrote under the pseudonym of Robert Faulcon, what could have been a piece of hasty expoitation turned out to be a textured, gripping six-book cycle of genuine emotional power. I'd heard that he was ill last week; I hadn't imagined that he wouldn't pull through. I know well enough what can happen. It's just a prospect that you don't want to entertain. Read Mythago Wood. Please. It's brilliant. You won't be sorry. It was quiet on the lot yesterday. Apart from the crews on the stages, most people seemed to have left early to travel for Thanksgiving. I went for a wander and found my way onto the giant set for Miami Trauma, Jeffrey Lieber's show for Bruckheimer which is now shooting. I don't think I'm giving any secrets away if I say that it's pretty spectacular, and resembles a space station in a big-budget science fiction movie. My medical thriller episode for The Forgotten had completed its filming over on Stage 6 the day before. It'll move into post-production next week and I'm really happy with the way it's been turning out. Director Guy Ferland nailed and enhanced every scene; now I know why Medea turned out as it did. This episode is a nice blend of creator Mark Friedman's vision for the series and the things I'm best at. And as we move toward production on the show's 'back five' they've been letting us be more adventurous, more character-driven, funnier when we need to be. As with my earlier episode, many of the crew from just about every department had previously worked on Eleventh Hour. Over the days of shooting I got into numerous conversations about the series, with everyone expressing dismay at its cancellation. Many made the point that shows with lower numbers are being hailed as this season's successes. When we wrapped and all shook hands after the final shot of the day - the 'Martini' - I told DP David Stockton that I looked forward to working with him again. His parting response was, "On Eleventh Hour, the Movie!" Which brings me to the Resurrection Campaign, a fan-driven movement which instantly grew out of the Renewal Campaign on the day the cancellation was announced. While I'm entirely sympathetic to what these guys are doing, they're completely independent of me. They're working to their own honest agenda, not some devious one of mine. When I heard that there was a feeling of disappointment at the lack of response to their approaches, I contacted one of their number, Kellie, and said that if she wanted to collate some questions from the participants in the Planet Hood forums I'd do my best to answer them here. What are your thoughts on our continuing this campaign...is there hope? I'd rule nothing out. I thought the British show was dead in the water until I got an email that said, 'Congratulations on the American sale'. But at this stage we'd be talking about a rebirth rather than a renewal. Normally I'd be a pragmatist and think, okay, that was good while it lasted, dust yourself off and move on. But what keeps me attached to it, even while I'm working on The Forgotten and developing other shows, is that the appetite for the material is proven but nothing else is filling its niche. It's an action show with hard science. The science may be dramatized - its processes shortened, its effects exaggerated - but the audience can sense that those processes are grounded in a reality. You didn't get that from The X Files, you don't get that from Fringe. They go the fantasy route. Which is entirely valid, but those are different worlds. What are you and the producers willing/able to do to help bring the show back? Are Bruckheimer and Warner Bros interested in trying again with another network? For my part, I could be up and running overnight. Cyrus and Ethan have moved on to other things but for the past six months I've effectively been in training for the gig. As far as Bruckheimer TV and Warner Bros are concerned, I'm on great terms with everyone there but they play their cards close to their chests. I'm not aware that reviving Eleventh Hour is high on anyone's agenda right now. Not because they don't believe in the show, but because all their energies are deployed elsewhere. A cancelled show doesn't normally stay in the portfolio until something unexpectedly puts it there. What more can we do as fans to help bring the show back? Stay visible. I can't say that any specific thing that you're doing will lead to success, but the fact that you're doing it proves there's a continuing audience for the show. Have you had any contact with any of the actors about the possibility of the show's return? Rufus and Marley had already moved on when I got out here. But that's a conversation we'd start when there was a real possibility of making it happen, and it would take place in the context of their other prospects and commitments. Most things are negotiable. Have you had any feedback/interest from any of the networks we have contacted? Did CBS ever give you a reason for canceling the series? My understanding is that they believed they had a strong development slate for the next fall season, and also that they could profit more from shows that their studio division, rather than Warner Bros, owned, even if those shows drew smaller audiences. Which explains why they picked up Medium. I know that Nina Tassler was a strong supporter of Eleventh Hour, and for that I thank her. But there was another CBS executive who let slip a few injudicious remarks when talking to a class of film students, which appeared later in one student's blog; we knew then that there was a faction within CBS that was less receptive to arguments for the show's renewal. Did Warner Bros ever give a reason for their choice to release the DVD as manufacture-on-demand and in the US only? I've tried to find out. All I know is that if it wasn't for the personal interest of Danny Cannon and the good graces of Peter Roth, there wouldn't have been a DVD release at all. Which to me seems mad. I can walk into any video store in LA and buy the British version. You can't tell me there's less of a market for a Bruckheimer show. What made the show so expensive... and will this affect someone picking it up? Sets, locations, dressing, and crew moves. Most shows have a 'precinct' - a series of regular locations where a significant proportion of each week's story can take place. It's already built and dressed, and in some cases is pre-lit. By always setting a certain number of pages in your precinct sets, you can get a lot of your material shot efficiently and at basic cost. Hood and Rachel were always on the road, and a big part of the appeal of their stories was that they'd show up in a new place every week. In production terms, every story was like a pilot. But a top LA crew is a phenomenal thing to watch in action, and Eleventh Hour's production team were integral to its success. I go back to what I said at the beginning. Rebirth rather than renewal. I need to gain more ground here, and somewhere along the line I'd need to meet someone who's interested in working with me, who has the power to greenlight shows, and who feels the spark when I pitch the idea of reuniting Rufus and Marley for a feature-length special or miniseries. I'd need to get the production company and the studio onside, since they own the property, but two things would work in my favour; a killer story, and a noisy fanbase. I can't now see a network picking it up, and I'm not even sure that network TV is the best place for Eleventh Hour stories - anything with any edge to it makes the networks very nervous. I can imagine doing the special as a piece of 'event' TV for one of the more quality-minded cable channels, where the prospect of snagging even a fraction of the show's 12m network viewers could have an appeal. We'd have to make it to a budget. But if the special proved enough of a draw, there would be an argument to go on and make episodes. Thre's a saying in Hollywood, that I picked up from Lynda Obst's book Hello, He Lied - ride the horse in the direction it's going. I can't force it to happen, but I can stay prepared to take advantage of any opportunity that may come up while I pursue those things I can make happen. The 22-inch metal armature from one of the animation figures created for the original 1933 King Kong has been sold at auction for £120,000. Because of the perishable nature of the materials used in their construction, little usually survives of stop-motion models once a few years have passed. As with the rest of us, only the skeleton stays around for any significant length of time. Anyone who visited London's much-missed, world-class Museum of the Moving Image on the South Bank will recall the figure of Mighty Joe Young, decaying in his wooden box like a mediaeval Memento Mori carving, held in place by a fragile strip of cotton. The armature in the Christie's sale came from a slightly larger model, created for the sequence in which Kong is seen in a long shot, ascending the outside of the Empire State Building. So, not one of the 'hero' Kongs, good for closeups and for expressing character... but still an authentic Kong. If you click here, you can read the Christie's brochure for the sale... turn the pages, zoom, rotate the picture... and save yourself 120,000 quid. 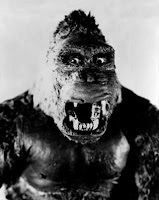 And clicking here will take you to an earlier Kong post of mine, from where you can navigate onward to a lovingly-compiled site about the movie and its cultural legacy... or you can just click here and go straight to the page about the surviving armatures. In the UK there's a boxed set that calls itself season one but is actually season three. Who on earth thought that was a good idea? In the US there's 'set one' and now 'set two' while from Australia 'season four' includes two episode commentaries from Woodward. Last night I hopped all over the web trying to work out what I already had and what would merely be duplicated by which other release. In the end my brain imploded and I went to bed. It's always pleasant to work on a set where visits by family members are welcomed. It makes for a nice atmosphere. On Friday, the father of our cameraman Eric Roizman came in to watch some filming and meet his son's co-workers. I got to lend him my chair in the video village. If you're wondering why that's a big deal, you can click here. 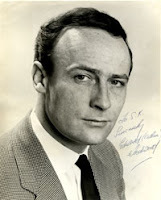 I just heard on the news that actor Edward Woodward has died at the age of 79. This is a post that I wrote in September 2008. Have you seen the new trailer for the remake of Clash of the Titans? Maybe I'd think better of the movie if it didn't stand so much in the shadow of Jason and the Argonauts. I have a personal memory of it; well, a tangential personal memory. It was 1980 and I wasn't yet making enough money out of Me Art to live on, so Yvonne, my then-agent, had landed me the job of novelising a David Essex bike racing movie called Silver Dream Racer. The movie was shooting at Pinewood Studios and I was invited down to visit the set and to meet with whichever executive had been assigned to supervise the writing of the tie-in. All I really remember of the meeting was being told in no uncertain terms that my expansions and additions to the basic storyline were less than welcome, and all that was required of me was the script in prose form and nothing else. Which wasn't true of the tie-ins I'd enjoyed, and still seems like a pretty joyless approach to the form. But Yvonne and I got lunch in the Pinewood commissary. Over at the next table was Burt Reynolds, in England to shoot Rough Cut for director Don Siegel. He was lunching with a tall grey-haired man with an eyepatch whom I guessed, on no evidence other than the eyepatch, to be Andre de Toth. Over on another table, both in white bathrobes, sat Judi Bowker and Neil McCarthy, Clash of the Titans' Andromeda and Calibos (Calibos was McCarthy in closeup, and stop-motion in the long shots). I said it was a connection. I didn't say it was a particularly impressive one. The Silver Dream Racer novelisation went out under the pseudonym of John Lydecker. I'd lifted the name from one of my own early radio plays, An Alternative to Suicide, for which I'd lifted it from Howard and Theodore Lydecker, the effects technicians who'd made Captain Marvel fly. That mechanical owl in Clash was called Bubo, if I remember correctly. And if I also remember my Camus correctly, that's also the French word for a plague abcess. Please, God, just tell me he's not in the remake. Over at his Complications Ensue blog, Alex Epstein provides a handy link to a site called Pilot School where downloadable scripts for a host of pilot shows can be found. I don't know where they're sourced from, but they include one of my drafts for the British pilot of Eleventh Hour along with Mick Davis's take on the same story for the US. I've been told that the script for the feature-length Crusoe series opener is somewhere out there as well, but I've never seen it. If you should fall across it anytime, let me know. You could do worse than hop over to Blowing my Thought Wad for this piece inspired by a recent Foyles event featuring 'veteran animator', Canadian-born Richard Williams. Williams is an animator of eclectic achievements, the most well-known of which I imagine to be Who Framed Roger Rabbit. I suppose Williams is to drawn animation what Ray Harryhausen is to stop-motion - the practitioner that all others in the field look up to and learn from. It's a fascinating post, and includes a video clip in which Williams breaks down the interacting elements that underlie the motion of a walking horse. Experience the sheer pleasure of having someone with a clear insight lead you to an understanding of something you didn't know (which used to be a major component of all TV in the UK, I'm reminded with a jolt). When I first went to London in the mid-70s, looking to break into the biz and filling the long hours by walking the streets and seeing the sights, one of the first places I sought out was Richard Williams' HQ in the corner of Soho Square. All I did was stand outside and look at the brass plate and feel a connection. I didn't quite realise it then, but I think I was responding to what I knew of Williams' professional attitude. He was about the work, the work, the work. Understanding it, knowing how things fit together, mastering it without shortcuts or compromise. I've heard it best expressed in Trevor Griffiths' brilliant play, Comedians. I can only paraphrase the line. Veteran comedian Eddie Waters tells his night-school class of aspiring performers that there's nothing wrong with wanting to be rich and famous, but you have to want to be good first. Because you can never get to be good after. Star Wars? I was right there at the beginning, I tell you. Well, when I say the beginning, I mean I got into the press show. In Manchester. All right, so it was hardly the creative coalface, but looking back on it I can feel that I was a witness to something. I saw the moment when we moved from a world with no Star Wars in it to one where it would forever be a part of the fabric. Many at that showing were genuinely astonished at what unreeled before them. They just weren't prepared for it. Until Star Wars came along, to be an sf fan was to have lowish expectations from the cinema. You learned to be very, very happy over not very much. If I didn't quite share the astonishment, that was for one simple reason. Back then I subscribed to American Cinematographer, and the issue dated July 1977 had carried a Star Wars cover and no less than four behind-the-scenes articles including one by effects supervisor John Dykstra, detailing the various ways in which the visuals were achieved. There was no skipping over the hard bits, no simplification for public understanding. This was a magazine for fellow-pros who didn't need to be talked down to, and hangers-on like me who didn't want to be. American Cinematographer was to be my guidebook through the boom in science fiction cinema over the next few years. Its editor was Herb A Lightman, a former cameraman who loved nothing better than to get out of the office and take himself down to a movie set where he could talk shop with old colleagues and maybe end up operating camera number fifteen on some massive, unrepeatable stunts-and-effects sequence. Lightman's almost childlike enthusiasm for the business of making movies, allied with the magazine's technical remit, resulted in some of the best insider coverage of screen science fiction around. Over the next half-decade or so, that same coverage gave me advance warning of a whole series of ground-breaking sf movies that would all owe their greenlighting to a "Star Wars effect". Not that Star Wars changed the audience. The audience was always there, its appetites unrecognised, uncared-for, not believed in – those around-the-block lines didn't gather by mass hypnosis. Rather, it forced a change in the industry's attitude to science fiction. Fox executives famously slept through the preview screening and would later scramble to retrieve and shred copies of their market research, out of sheer embarrassment. The success of the film was one massive head slap which made them start taking the idea of big-budget sf very seriously indeed. To me the most memorable films of that period were the ones that owed their commercial viability to the Star Wars effect, but not their inspiration. Alien. Close Encounters. Superman. Blade Runner. As each one came along, its groundbreaking techniques flagged and enthused over by Lightman and his team, it really felt as if the future was opening up and that the possibilities of screen sf were going to be endless. So what happened? Did that prove to be the case? I'd have to say no. Back then I thought of it as a tidal wave, carrying us forward. But now I think of it more as an earthquake, shaking things up where they stood and leaving us with a different landscape. I look at screen sf now and what I mostly see is new variations on (almost) thirty-year-old templates – which themselves were revisions of much earlier, lower-rent models. It's hard to find a civilian space crew that doesn't owe something to the bickering bluecollar bunch from Alien, or a scary extraterrestrial that doesn't owe something to that same movie's indestructible phallus-headed cockroach. If it's a non-scary extraterrestrial… well, even ET was pretty much a calving from the Close Encounters iceberg. While we're at it, knock off that movie's feelgood ending and give Roy Neary a badge and Clarice Starling for a sidekick, and you've got The X Files. Has there been an Earth's-future dystopia since that hasn't made us think of Blade Runner? I look at Spiderman or Iron Man now and I see the same basic approach that made Superman work. It was that film's screenplay that cracked the problem of the comicbook movie with the realisation that the key to believable superdeeds lies in the way you handle the hero's private life. The humour, the form, the tone, the exact placing of the line between fantasy and reality… it's all there in the template. It was a fertile period, and Star Wars allowed it to happen. It was a great time to be a fan. The downside is that if you felt the first impact of something like Alien, it's hard to get too excited when a Pitch Black comes along. And in a way, we've taken some backward steps; my heart sinks at the prospect of committing two hours of my life to a movie in which I just know that the last act is going to consist almost entirely of two CGI characters slugging it out in a CGI world. When the Art of Star Wars exhibition was running at London's Barbican centre, I took myself along. Nearly all of the props and sketches were from the later films but I might as well have been back in 1978. The only difference being that while I still find Star Wars and The Empire Strikes Back watchable, Return of the Jedi seems to have set the tone for the rest of them – a bunch of elements thrown together, some you like, some you don't, but the whole thing lacking in coherence and feeling somehow unnecessary. For me, watching the later Star Wars movies is like being buttonholed by a gamer at a convention who insists on recounting in great detail all the fantastic and hilarious things that happened to his character in last night's RPG. Lucas has extended the weaknesses of the original – the cod mythologizing lifted straight from Joseph Campbell's Hero with a Thousand Faces, the made-up future politics – while losing sight of its youthful joie de vivre. And then he had to revisit the originals, too. What would the young Lucas have made of this middle-aged stranger imposing revisions on his work? George, you're just fiddling now. Stop it. You're spoiling it. American Cinematographer's no longer the magazine it was, either.